Remember all parents get to train for free during the month of January! Annual AASD BOOT CAMP class Saturday, January 31st, 10:00am until 11:30am, earn the prestigious Boot camp t-shirt and pizza afterwards. Taryn started with AASD in September of 2014. It was apparent from the start that Taryn was a go getter for sure. Always trying her best, Taryn sets an example for others to emulate. Taryn can always be counted on to give 100% and then some and what amazes everyone is her incredible smile. 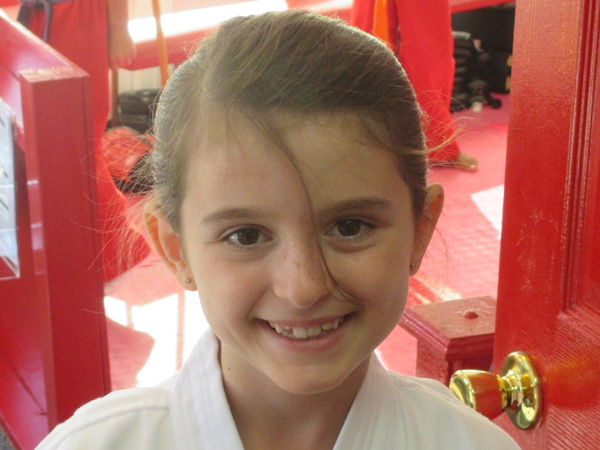 Sifu Rick and staff are very confident that Taryn is destined for Black Belt and beyond. Sifu Rick & Staff would also like to salute Taryn’s parents Geoff and Cami for their support of Taryn and our Black Belt school. How fast the time has gone. Do you remember New Year’s Eve a year ago? What you did and where you were? Was it different this year? Did you accomplish all of those resolutions you promised yourself on New Year’s Day? If you did, good for you. If not, you are among the majority. Changing is hard. We have a desire to change but, in reality, when we make a change (big or small), we quickly begin to feel uncomfortable and long for our regular routine. Making changes, such as watching what you eat, starting a fitness regime, or even getting in or out of a relationship, starts with a commitment to yourself and a change to your mindset. So many of the things we do are motivated by emotions and good intentions, but then the voice in our head starts to talk and we listen. We justify our return to old routines, telling ourselves it will be okay. We can eat the donut, or take a walk with the dog instead of working out in the gym. So, what if you really want to make a change? First, understand how the brain thinks. Change is going to be hard, but remind yourself it will be worth it. What about exercise? People across the world start out the new year by purchasing a gym membership or home equipment to jump-start their fitness routine. Again, we have great intentions and want to see ourselves stronger, more energetic, and more fit. January is the busiest time for gyms and fitness clubs — everyone promises themselves they will start to look and feel better. The problem is we all join, but by the end of 30 days we have relapsed. Why? Because humans hate change. So, if you know this and can somehow maintain your positivity, you have a very good chance at success. We all want to be the best we can be. Years of justification can get in the way but, this time, you know what to expect. You have the control to stop going back. You have the willpower to keep moving forward. You just have to believe in yourself. Have the courage to stick to it. After all, it is the New Year — a chance to start over.